The first few minutes of the day are crucial to setting the pace for everything that comes after. No matter how deep or disrupted my night’s sleep was, I always like to start the day on the right foot. I even start my routine before I get out of bed in the morning! The One Thing: what is the one thing I have to accomplish today that makes the rest of my life easier? Also, what is the one thing for the week, the month, and the year? These nuggets of guidance I got from a phenomenal book that simply everyone who wants to streamline and rocket-ship life needs to check out! Positive Sentiments: I like to think about anyone/anything that is particularly frustrating or challenging for me (an ex, a short-sighted politician maybe..) and envision them happy, healthy, at ease, and just generally in a good state. I swear, having positive vibes toward the people or events in your life that are hard makes dealing with them infinitely easier. Also before I get out of bed, I throw off the covers, and reach one leg around the other and get my spine moving, then do the other side. Then I put both legs straight up in the air and push through my heels to get my hammies and calves to wake up. From there, I spread my legs wide and let my adductors open up a bit too. After those bed stretches, I stand up slowly, reach my hands straight up into the air, expand my ribcage as much as I can, and look straight up reaching through my chin toward the sky. After being curled in a fetal position for most of the night, these few moves really get me feeling ready to be upright again. The last little morning stretch I do is on the way to the loo. I stop in the doorway for a few seconds to reach my elbows to the door frame (just above my shoulders) and lean into the bathroom with my head up and chest leading the way. I borrowed this term for the wonderful Kelly Starrett in his book Becoming a Supple Leopard. While I brush my teeth, I stand with both feet parallel. Spreading my toes, I hold onto the ground with my soles. Keeping my toes straight ahead I “screw in” my femurs by creating torque in the legs externally rotating my thighs. This sets my hips into wonderful alignment and turns on the glutes. Then I pull in my lower belly and “stack” my rib cage over my hips. Thinking about the strong muscular connection between the ribs and hips, I then stack my shoulders directly over the ribs. Lastly the head lines up over the shoulders. This helps me start the day in optimal posture and feeling very alpha female! 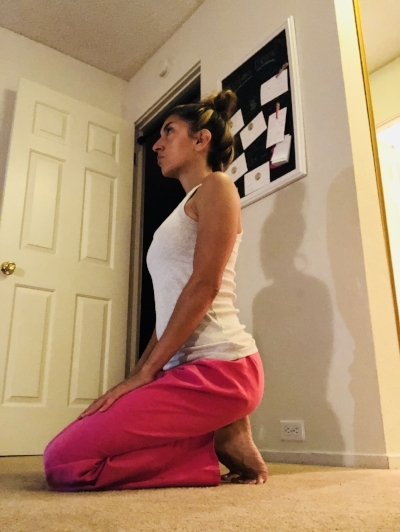 Start on all fours on the floor and use the same “screw in” tactic with your hands to anchor the shoulders into the trunk. Line up the knees directly under your hips and see if you can get 90 degrees at all the limbs. Then reach one arm (thumb up) straight up and out and add the opposite leg (toes pointing straight down and glute tight). Pause to make sure your trunk is solid and core is turning on. Then switch sides several times slowly to activate all the major muscle groups. End on all fours again, and do a few head nods: up and down, side to side. After centering out, squeeze one flank wag your bum to one side, while simultaneously looking into that shoulder to see if you can see your hip. Switch a few times trying to see your tail throughout. Now, widen your knees as far as you can and pull your feet wide so they are in line with your knees. Use your hands to help you slowly slide your weight forward and backward into a good hip opener. Do not hold any position for too long as you may overstretch. Lastly, bring your knees and feet all the way together (touching at big toe and heel). Tuck your toes under, and slowly start putting more and more weight into your feet. Ideally, all 10 toes (including pinkies) are touching the floor and you're sitting upright with no weight in your hands at all. Don’t get frustrated if this seems impossible at first. Deep ankle dorsiflexion is not practiced much in our modern day footwear, but be patient. Hold the posture as long as you can before coming out of it carefully.